Inside this month we explore the recently released tax stats – the highest earning occupations, the wealthiest suburbs and who contributes the most tax. Plus, the main residence exemption warning for expats and foreign residents. Who contributes the most tax? Where do we make our money? What deductions do we claim? 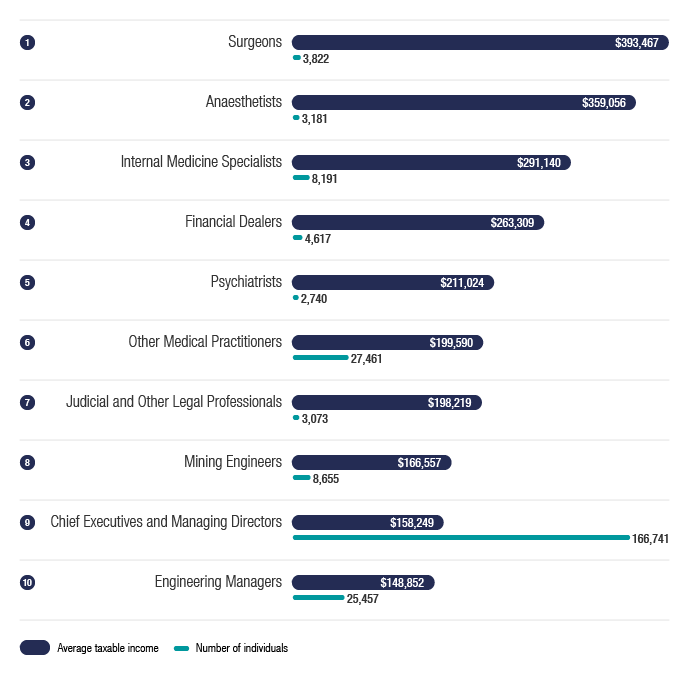 The occupation with the highest average salary is a surgeon on $393,467, followed by anaesthetists, internal medicine specialists, and psychiatrists. Legal practitioners came in seventh on an average taxable income of $198,219. Chief executives and managing directors came in ninth. It’s worth pointing out that these salary statistics are the average taxable income of a particular occupation category – so, any deductions or losses the individual is able to claim have already reduced the salary represented. It’s not the salary that someone would be paid. These figures would also pick up a mixture of full time and part time workers. 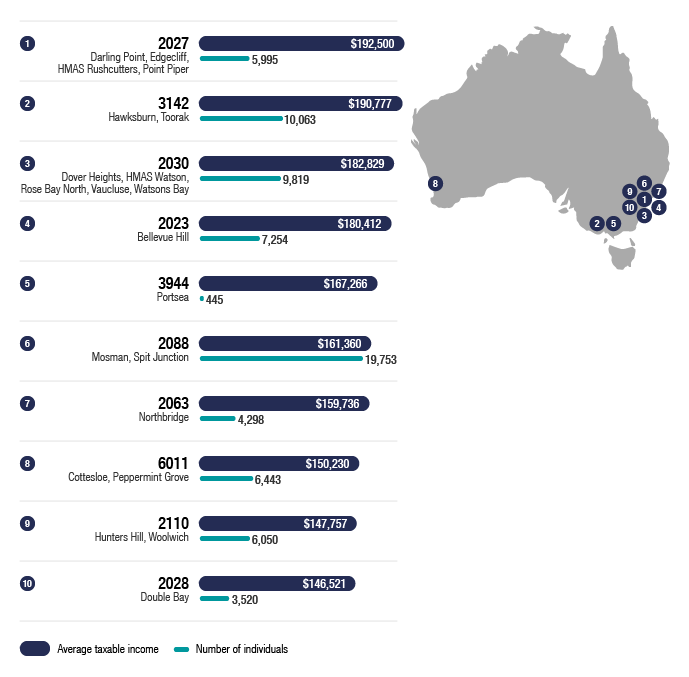 If you live in Darling Point, Edgecliff, or Point Piper (the 2027 postcode) you are in Australia’s wealthiest suburb with an average taxable income of $192,500. By contrast, postcode 2387, covering Bulyeroi and Rowena in far North East NSW, had the lowest average taxable income of around $12,000. Victoria has five of the bottom 10 postcodes with 3482 recording the second lowest average incomes nationally. Individuals contribute 52.7% of all tax collected, companies 18.9%, and superannuation funds 4.2%. The sectors that contribute the most tax dollars were the financial and insurance sector (9%), followed by wholesale trade (8%), manufacturing (6%) and professional, scientific & technical services – that’s accountants, lawyers, managers, scientists, etc (6%). Mining only contributed 0.2% of the tax take. When it comes to individuals, out of a working population of around 15 million individuals, less than 11 million of us pay tax (27% don’t pay any tax). Those on taxable incomes of $80,001 to $180,000 pay 39.8% of the tax paid by all individuals, averaging $30k per person. The highest income bracket ($180,001 and above) pay over four times more than the income tax bracket below them averaging $135,000 per person and contributing over 30% of the tax collected from all individuals. Over $6.5 bn in capital gains tax was collected from individuals in 2015-16. As you would expect, the majority of this was from real estate (40.6%) with the remainder made up of other assets (39.7%) and shares (19.6%). Companies and super funds contributed over $5 bn in capital gains tax. Only 2.6% of gains made by super funds were from real estate. Companies pay 18.9% of all tax. Around 14% of all companies paid no tax or made a loss, which is fairly consistent across the years varying by 0.3% for the last three years (lowest in 2013-14 and highest in the most recent statistics, 2015-16). The largest companies, which represent 0.1% of all companies, contributed 55% of the tax paid by all companies (over $36 bn). Medium sized companies were the next biggest contributor at 15.2%, followed by micro businesses, the largest group by volume, at 12.7% of the population of companies. Salary and wages are obviously the biggest category of income for individuals averaging $58,827 (up from $57,576 in the previous year). Once again, these figures represent taxable income, not the gross salary or wages someone earns. We made over $42 billion in rental property income in 2015-16. Over 2 million people have an interest in a rental property, with almost 20,000 of those having six or more rental properties. Most however (1,494,837) have just one property interest. Net rental income has been fairly static over the last few years at -$3.6 billion (it was lowest in 2011-12 at -$7.9 billion before the Government reined in deductions). The list of deductions should give you a good indication of where the ATO is focusing their compliance activities. 8,627,122 individuals claimed work related deductions in 2015-16 with an average claim of $2,548 (with most claiming around $1,123). 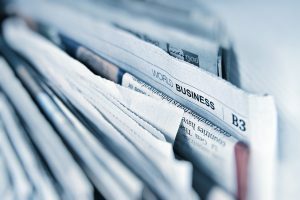 The ATO have already flagged work related deductions as a major compliance focus and it is clear that the ATO has already started taking active steps to improve compliance in this area. $45.7 billion in rental property deductions were claimed in 2015-16 – that’s more than the education budget at $35.52 billion in the same period. 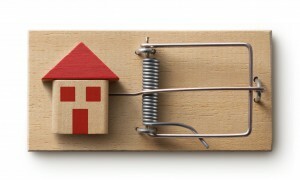 61% of all those with rental property interests claimed a loss. When it comes to donations, we have become tighter with around 57,000 less people making a donation. The average amount donated between 2014-15 and 2016-17 dropped from $674 to $634. Key take out: The statistics provide an indication of where you can expect the ATO to focus its compliance activities. Work related deductions, especially travel expenses, are a key area. Even if you only claim relatively small amounts, don’t assume that the ATO won’t query the deductions and ask to see evidence that proves you actually spent the money, you were not reimbursed, and the expenses were incurred in the course of earning assessable income. While the average superannuation account balance is $115,945, the median is only $37,473, which is clearly not enough to self-fund retirement. The median account balance of men aged 55 to 59 is $124,738, with women likely to have only $83,103 in this same age bracket. The greatest disparity between men and women is in the 50 to 54 age bracket, with women likely to have balances 36% less than their male counterparts. The highest income earners, those on taxable incomes above $180,000, had the highest super balances with a median of $254,273 ($532,278 average). The average superannuation balance in the ACT is higher than anywhere else in Australia at $185,777 (median of $57,239) for males, and $157,981 (median of $47,364) for females. The gap between males and females is also likely to be less with the average super account balance for females 15% less than males. By contrast, females in Victoria are likely to have super account balances 25% less than males. Key take out: There are some very real tax benefits to building the superannuation of your spouse using the super splitting rules. Currently, individuals are generally not subject to capital gains tax (CGT) on the sale of the home they treat as their main residence. If the home was your main residence for only part of the ownership period or if the home is used to produce income (for example, you use part of the home as business premises or rent out part of the property), then a partial exemption may be available. In addition, if you move out of your home and you don’t claim any other residence as your main residence, then you can continue to treat the home as your main residence for up to six years if you rent it out or indefinitely if you don’t rent it out (the ‘absence rule’). The main residence exemption is currently available to individuals who are residents, non-residents, and temporary residents for tax purposes. Under new laws before Parliament, you will not be able to claim an exemption under the main residence rules if you are a non-resident for tax purposes at the time you sell, even if you were a resident for some (or even most) of the ownership period. The new rules do not allow for partial exemptions. If, however, you are an Australian resident at the time you sell, then the normal main residence exemption rules apply, even if you were a non-resident for some or most of the ownership period. Someone holding property at 9 May 2017 can apply the current rules if the CGT event occurs on or before 30 June 2019 – for a sale of a property the CGT event date is likely to be the date of contract not the settlement date. This transitional period gives non-residents some time to sell their main residence (or former main residence) if they choose and obtain a level of tax relief under the main residence rules. Keep in mind that we are talking about tax residency, which has its own set of rules to the immigration, visas and citizenship requirements. It’s different and you need you need to be clear about where you fit. If you are an Australian citizen working overseas but a non-resident for tax purposes, these new rules are likely to affect your main residence in Australia. If you maintain your main residence in Australia, you can use the absence rule to maintain the exempt status of your property just in case you decide to return to Australia. When you return permanently to Australia and decide to sell, you are likely to be able to access the main residence exemption (or a partial exemption). If you rent out your property while you are away, the absence rule allows you to treat the property as your main residence for up to six years. Be wary of exact dates here. One day the wrong way or a misapplication of the absence rule could make a significant difference to the tax you pay. If you sell the property while you are a non-resident, once these new laws come into effect, you will not be entitled to the main residence exemption at all. Similarly, if you die while overseas, and your home is sold within two years of the date of your death, it’s likely that your beneficiaries will not be able to claim the main residence exemption. If you are a foreign citizen currently living in Australia but planning to leave Australia at some stage in the short to medium term then these new rules are likely to impact on you. If you owned your home at or before 9 May 2017, you can access the main residence rules on or before 30June 2019 if you sell the property. However, if you leave Australia and cease being a resident of Australia before selling the property and the sale occurs after 30 June 2019 then you will not be able to access the main residence exemption. This will mean that you will pay tax at your marginal tax rate on any gain you make on the sale of the property. You are also likely to have limited access to the general CGT discount. If you are uncertain of your position or the likely impact of these new rules on you, you should seek advice. Tax residency status is often complex and is not intuitive – it’s important to get it right. The Labor Party has taken a pre-election strike by promising to remove the GST on tampons if they are elected. At present, tampons and other sanitary products, like razors for shaving and nappies, are considered consumables and GST applies. Incontinence pads however, because they are required for a medical issue, are GST free. This is not the first time the ‘tampon tax’ has been raised. The Greens previously put forward the strategy and in 2015, then Treasurer Joe Hockey agreed to remove the tax only to have the idea slapped down by then Prime Minister Abbott as “politically correct”. Part of the problem is that the Australian GST has carve outs – some things are in and others out. It’s always going to be political and the boundaries will always be tested. By comparison, New Zealand applies GST to all consumption – there are no carve outs, leaving the tax system to collect tax and the social security system to meet the needs of those not able to provide for themselves. The Government has announced that the maximum number of members an SMSF can have will increase from four to six. At present, under section 17A of the SIS Act, to meet the definition of an SMSF the fund must have 4 members or less. There is a long way to go before this change becomes law. We’ll bring you more details as they arise.